Engagement Tools: Productivity Boost or Missing a Voice? The productivity and collaboration tools market has grown to be worth around €9bn globally and the active user share is phenomenal. Slack is the platform most have probably heard of but there are many and often have simple names like Fleep, Hangouts, Simpplr, Jostle to name a few. The projected worth of the industry is an interesting statistic but for the purposes of this post, it’s a secondary metric by comparison to active daily users. According to DMR, Slack alone has over 9 million weekly active users with 140 minutes spent on the platform each weekday. Now, scale that figure up for the list of collaboration tools on the market — truly staggering use that rivals the original telephone. This points to the rise of asynchronous – well… you’d have to say established — communication methodologies. Blueface focus on perfecting real-time communications — such as 1-to-1 hosted voice, call conferencing and video — while reducing access barriers and workplace disruption. The big question is: does the sole use of collaboration software tools actually increase productivity or are extra tools needed? The high volume of incoming messages and notification jingles from instant messaging apps can leave staff overwhelmed and your message devalued. This incredible video — Vhils: Communication — outlines how much communication has changed since the invention of the telephone. These applications remain open all day, leading to ease-of-access to information and to-a-certain-extent a mountain of information to wade through. 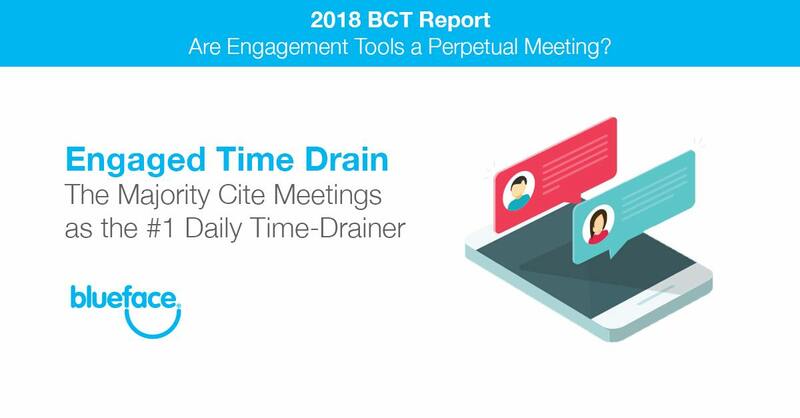 According to Blueface BCT Report 2018, meetings are the most disruptive process in their workflow. As mentioned in our introduction, these tools are tantamount to a constant, semi-synchronous meeting. More time on the instant messaging app, either reading or responding to the different chats for long periods of time, can lead to the low productivity. People are disruptively reactive to productivity platforms – such as Slack – when a message comes in, and they want to respond immediately before it’s too late. 25% of professionals surveyed told ReportLinker they feel the pressure to answer IM’s right away, even if they’re in the middle of other work. It is a very fast-paced service, so there is often no time to contemplate before responding to the messages. Every company should practice open lines of communication but considering how nonconstructive many instant messages or emails can be employees will often find themselves distracted. A study on ReportLinker showed that instant messaging practices are becoming very popular in the tech industry. 71% of employees rely on the application and in international companies, it is used by 62% of the workforce. International time zone differences are a big contributing factor to productivity tool distraction. Instant messaging apps are very “in the moment”, where people chat back and forth instantly, searching and trying to find pertinent details in the conversation can be tricky. According to the Wall Street Journal, researchers from the University of California Irvine shadowed workers on the job and studied their productivity in the workplace. After distractions or interruptions in someone’s work, it takes an average employee about 23 minutes to get back to the task. With constant interruptions and the total number of minutes adding up after each distraction, it can take a lot of time away from work that needs to be completed. These progressive interruptions in work lead to low productivity in the workspace. With Unified Communications, it is a non-disruptive approach to communications where it decreases overall disruption. Every touchpoint of your communications unified fax, email, voice — all-in-one. The access to communicate with people all over the world is also very easy to connect with, whereas, with online messaging systems, it may take more time to receive an answer. Voice can resolve many problems listed above in moments. Customers and employees can communicate effectively through voice communications so every message lands the way it was intended. The irony of project management augmenters is the real-time nature of conversation. Really important information gets buried in channels easily and can be difficult to recover. Live chats – while an excellent way to communicate intermittently – can lack context and organization. There is an immediate response pressure and messages mount up quickly. Long in nature conversations and constant topic switching are other noticeable quirks of productivity tools. Even though there are keyword search functions, all of the messages and conversations are clumped together, leading to no organization in the chat. Many conversations in engagement software tools will get crowded out and disappear within a day due to a large number of messages being exchanged. The most important details that were said in the morning may be lost by early afternoon or even an hour after that chat was sent due to the abundance of message exchanges occurring. While it is important to reinforce with copy, voice establishes a quick understanding of what is being communicated. Voice communication in combination with other tools creates a perfect communicative ecosystem – vital for any organization. The Blueface UC Portal unites myriad communication methods under one umbrella. Unless you have hired a group of copywriters for every role in your business – text often fails to convey tone and true meaning – often leading to misinterpretation. While sending and receiving real-time messages, it is very easy for you or your recipient to misinterpret and receive it in a way that was not intended. With voice communications, it is far easier to grasp the scope of the message that is being communicated. A study showed that messages get misinterpreted or need further explanation about 80% of the time over email or another messaging database. Eventually, employees will begin to over-rely on written communications such as email, collaboration tools – such as Slack – or instant messaging platforms when picking up the phone would be a quicker resolution. Remote working is becoming a very popular trend among businesses. As people are all over the world, it is still very important to connect with the company through voice calls, video conferencing, etc. According to the Harvard Business Review, 87% of remote workers feel more connected through the use of video conferencing. This shows the importance of the voice communications and how people are feeling closer to their companies and fellow employees than through written communications like instant messaging. Tools like the video conferencing, open up discussion for people to express their different ideas no matter where they are in the world and it helps them touch base in a more efficient way than written communications. Communication is growing all over the world and these measures to keep in touch are very useful in keeping relationships in the workplace. Voice communication and the advancement of the technologies that make this possible are essential in the workplace. Voice – depending on the writing acumen of your staff – is far more effective than written communications due to nonverbal cues that occur in conversations. Understanding the tone, emotion, and language content of the speaker is very important when talking to another employee or customer to take in the whole meaning. With voice, you can connect with more people, create relationships, bring clarity, and give feedback on any topics at hand. When communicating online, you lose the ability to speak with your customers and create a sense of connection and trust. Systems like UCaaS and VoIP have helped maintain these relationships through a combination of voice and these productivity tools.